Except for service animals, pets may not use trails. Dogs must be on a six-foot leash at all times. *NOTE: Vehicles over 22 feet in length are not permitted in the parking lot at this park. The park is open to day use visitors a half hour before sunrise to half hour after sunset. Kiosk opening and closing times are variable. Visitors are expected to self-register at the self pay station when the kiosk is closed. There are a limited number of parking spots available in Julia Pfeiffer Burns State Park. Maximum vehicle length is 22'. Parking fills up quickly. If the lot is full, you may park on the side of Highway 1 provided your vehicle is entirely off the road with no part of it on or over the white line. Use extreme caution if entering or exiting your vehicle on the highway. There are two established picnic areas in the park with picnic tables and charcoal grills. One is in the parking area near the Ewoldsen Trailhead. The other is on the Ewoldsen trail, in the redwoods, a short walk in. Dogs are not allowed on any State Park trails, but they are allowed in the paved parking area. Dogs must be on a leash at all times. Do not leave your dog unattended at any time. See DOGS IN BIG SUR for more information on where to take your dog. There are a number of trails in the park. See the Trails section for more information. In December and January the bench at the end of Overlook trail is an excellent place to watch for gray whales migrating southward to their breeding and calving grounds off the Baja California coast. Many whales pass close to shore at this point, and occasionally one will come into the mouth of the cove. In March and April, they can be seen returning north to their summer feeding grounds in the North Pacific. Sea otters can sometimes be seen in the cove, and harbor seals and California sea lions are occasional visitors. Many sea and shore birds - sleek black cormorants, seagulls, brown pelicans, and black oystercatchers also make an appearance. The Pelton Wheel supplied power needs to residences, a blacksmith shop and a mining car tram that ran between the main house and Highway One. Hans Ewoldsen built the paddle wheel in 1932 using hand-split redwood from the canyon and other materials that he bought, working in the machine shop of the construction crew which was building Highway One.The undershot wheel ran a 32-volt generator and was the first electric power in the Big Sur area. Between Partington Point and McWay Creek is the Julia Pfeiffer Burns Underwater Area, which was established in 1970 and is now a scuba diving area. The north cove of Partington Cove is the entry to the underwater area. Special-use permits, available at the Big Sur Station, allow experienced scuba divers to explore the area. A valid diver certification card from a recognized organization (SCUBA only) and a driver's license are required for the permit. A diver must also have a device capable of obtaining and maintaining positive buoyancy. Diving permits are limited to a minimum of two divers and a maximum of ten divers. Diving alone is not permitted. The terrace is all that remains of Waterfall House, the residence of Lathrop and Helen Hooper Brown. 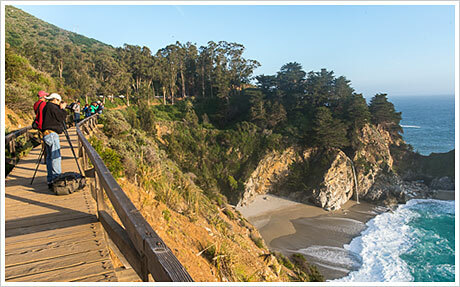 When the Browns began to acquire their Big Sur acreage in 1924, Mrs. Brown became acquainted with Julia Pfeiffer Burns, the daughter of a Big Sur pioneer family. In 1962, Mrs. Brown gave the ranch to the state for use as a state park dedicated to the memory of Julia Pfeiffer Burns.